John R. Phillips, U.S. ambassador to Italy, will be in attendance as an exhibit and symposium highlighting the University of Notre Dame School of Architecture’s discoveries at the historic Roman Forum open April 2 (Wednesday) in Rome. Dario Franceschini, Italy’s Minister of Cultural Heritage and Activities and Tourism, and Véronique Dauge, head of the Cultural Unit, UNESCO Regional Bureau for Science and Culture in Europe, also will be in attendance. Ground-breaking methods of documentation and interpretation of World Heritage Sites by the Digital Historical Architectural Research and Material Analysis (DHARMA) research team at Notre Dame will be the focus of the collaborative symposium, to be held April 2-4. 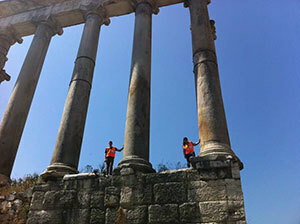 Launching in conjunction with the symposium is the first 3-D exhibit on historic preservation in the Roman Forum, which will be on display from April until September in Rome. The exhibit will display the collective efforts of DHARMA’s detailed architectural drawings and watercolors, a 3-D model of the Forum and its monuments and gigapan high-resolution panoramic photographs. These will be accompanied by detailed architectural analyses together with past and present research and discoveries undertaken by the Soprintendenza Speciale per i Beni Archeologici di Roma, with the curatorship of Patrizia Fortini and Notre Dame’s Krupali Krusche and Giovanna Lenzi-Sandusky. Titled “The Digital Future of the World Heritage,” the symposium is based on a memorandum of understanding with the UNESCO World Heritage Center and is in collaboration with Soprintendenza Speciale per i Beni Archeologici di Roma and NASA. The symposium also is being made possible by the support and assistance of Notre Dame’s Nanovic Institute for European Studies, with additional support from Notre Dame International. Scholars in the sciences and humanities are trying to uncover a layer of evidence from the past, using today’s technology in order to make sense of, and reveal, a particular reality. With the convergence of both traditional and new technologies, researchers are able to reveal a greater depth to the story that history has left behind. The DHARMA symposium will focus on the need for state-of-the-art tools and technologies that transform thinking about documentation, interpretation, archiving and preservation for future generations. Technology transfer in the humanities is still in an exploratory phase. Engaging university faculty from other fields with expertise in established technologies — such as georegistration, land and subsurface mapping/imagery, remote sensing, cartography, accelerator mass spectrometry and finite element methods — has the potential to inspire innovative methods of documenting heritage and furthering research on site. The symposium also will be a platform to present various techniques of merging scientific research with site management and the benefits of such joint approaches to the improvement and management of World Heritage Sites. Government and state agencies involved in running sites will be introduced to the latest techniques in documentation, analysis and historic research to study and maintain sites. The aim of the exhibition, which is being held in the Curia at the Roman Forum, is to provide architects, art historians, academics and the general public with a greater understanding of the development of architectural documentation of excavations at the Roman Forum from 1905 to 2014. The primary objective of the research and culminating exhibition is to advance scholarship and knowledge on the recent developments at the Roman Forum. 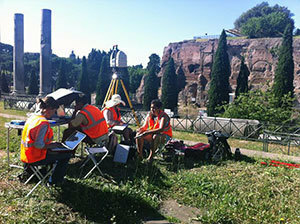 Focus on the documentation of the Roman Forum was developed as the consequence of an existing need in the architectural community to integrate innovative methods of digital documentation and 3-D scanning with traditional hand-measuring techniques to produce truly precise measured drawings by hand and computer. This can provide a basis for generating highly critical and analytical work. The larger objectives of the exhibit are to draw attention to the historic methods of the early scientific documentation at the Roman Forum and the evolution of these methods, providing a basis for new methods of documentation to be developed and utilized in the field today and in the future. The exhibit will be accompanied by never-before-seen detailed historic text and drawings, materials of Giacomo Boni’s 19th-century documentation, which alongside the scientific 3-D, high-definition DHARMA documentation, drawings and watercolors show continuity in innovative methodologies in the field of documentation from 1900 to the present. The exhibit will allow visitors to gain a comprehensive understanding of the Forum as a whole, while being able to gain greater understanding of its individual monuments in a manner that has never before been possible. The principal collaborators for the symposium and exhibit are Krusche, Fortini and Lenzi-Sandusky. DHARMA is a research team founded in 2007 and based at Notre Dame’s School of Architecture. The team, under the direction of Krusche, works on documenting historic monuments and World Heritage Sites around the world with the use of Leica 3-D laser scanners. These high-speed, long-range scanners are ideal for projects that are difficult to document by traditional methods. The scanner provides researchers with the most field-efficient methods of data collection. Recently the team has also used 3-D scanning to better understand the effects of time on historic buildings and reconstruction processes of buildings with historical value. World Heritage is the designation for places on Earth that are of outstanding universal value to humanity and, as such, have been designated by the World Heritage List to be protected for future generations to appreciate and enjoy. Places as diverse and unique as the Pyramids of Egypt, the Great Barrier Reef in Australia, the Galápagos Islands in Ecuador, the Taj Mahal in India, the Grand Canyon in the U.S. and the Acropolis in Greece are examples of the more than 900 natural and cultural places on the World Heritage List. Originally published by William G. Gilroy at news.nd.edu on March 28, 2014.